This name uses Spanish naming customs: the first or paternal family name is Read and the second or maternal family name is Griffin. Alfredo Claudino Baptist Read Griffin (born October 6, 1957) is a former Major League Baseball (MLB) player, who played shortstop for four teams from 1976 to 1993. He is currently the first base coach for the Los Angeles Angels of Anaheim. Alfredo began his career as a member of the Cleveland Indians, who signed him as an amateur free agent in 1973. On December 5, 1978, before having played a full season in the majors, he was traded, along with Phil Lansford (minors), to the Toronto Blue Jays for Víctor Cruz. Alfredo made an immediate impact, sharing the American League Rookie of the Year Award in 1979 with John Castino. In 1980, Griffin led the Major Leagues in Triples, tying Willie Wilson of the Royals with 15 ...... in fact, both Griffin and Wilson set an AL record for most triples in a single season by a switch-hitter. Five years later, Wilson himself shattered the record that he shared with Griffin by tallying 21 triples in 1985. In 1984, he was named to the All-Star team. This was explained by John Feinstein of the Washington Post as: "Making the All-Star team the hard way: Major league baseball pays the expenses for each player here and for one guest. In most cases, players bring wives or girlfriends. Damaso Garcia, the Toronto Blue Jays' second baseman, brought his shortstop, Alfredo Griffin. When the Tigers' Alan Trammell hurt his arm and could not play tonight, Manager Joe Altobelli named Griffin to the team, partly because he's a fine player, but mostly because he was here." All the same, Griffin was valued far more for his glove than his bat. Mike Scioscia called him "the Ozzie Smith of the American League." A steady, everyday shortstop, he spent six years with the Blue Jays, playing in 392 consecutive games. He was traded after the 1984 season to Oakland, where, despite his reluctance to draw walks and a tendency to be overaggressive on the basepaths, he began to harness the offensive promise that he showed in 1980 when he set an AL record for most triples by a switch-hitter with a league-leading 15. He also had some very bad seasons: in 1990 when he became the last player to finish last in the National League, of those who qualified for the batting title, in batting average, on-base percentage, and slugging average. Griffin won the American League Gold Glove award in 1985. After establishing personal bests in most offensive categories with the Athletics, Griffin was traded to the Dodgers for Bob Welch prior to the 1988 season in a move that helped both teams to league championships. A Dwight Gooden fastball broke his hand in May 1988, and he was disabled for much of 1988 and part of 1989. Griffin returned to Toronto in 1992 and was a key contributor as the Jays took the first of two consecutive championships. On October 23, 1993, he stood on deck as Joe Carter faced Mitch Williams in the ninth inning of Game Six. His career came to an end moments later when Carter homered to win the World Series for Toronto. Alfredo Griffin holds the unfortunate record for having been the first player in major league history to have started three times for the opposing line-ups in a perfect game: against Len Barker in 1981 as a Toronto Blue Jay, then against both Tom Browning in 1988 and against Dennis Martínez in 1991 as a Los Angeles Dodger. Four Tampa Bay Rays have since joined him: Evan Longoria, Carlos Peña, B. J. Upton and Ben Zobrist all played on the losing end of Mark Buehrle's perfect game in 2009, Dallas Braden's perfect game in 2010 and Félix Hernández's perfect game in 2012. 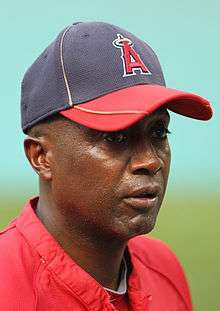 He is currently the first-base coach for the Los Angeles Angels of Anaheim in MLB, and also for the Estrellas Orientales (Eastern Stars) in his native Dominican Republic's Winter League. On April 15, 2013, Griffin was out for a game to apply for United States citizenship. ↑ Córdova, Cuqui (8 December 2007). "Béisbol de ayer" (in Spanish). Listín Diario. Retrieved 14 August 2014. ↑ Merron, Jeff. "These guys weren't stars". Page2 (ESPN). Retrieved July 11, 2006.